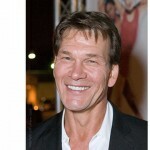 Pop culture icon Patrick Swayze passed away on September 14, 2009 at the age of 57. For almost two years he had been battling pancreatic cancer and all the while kept his head up and continued acting. Swayze was an actor and singer-songwriter, but more than anything else, a dancer. His dance moves became immortalized in 1987 when the movie “Dirty Dancing” came out. I saw this movie at least fifteen times and couldn’t get enough of this smooth operator on the dance floor. The movie became an international hit and forever placed Swayze in the category of “heartthrob”. In real life his heart belonged to his long time wife, Lisa Niemi Swayze. They met when he was 19 and she was 15 and taking dance lessons from Swayze’s mom. They married in 1975 and remained together through thick and thin, an unlikely reality in Hollywood. What most people don’t know is that Swayze had always been a fabulous and much trained dancer. He studied with the Harkness Ballet Company, then the world renowned Joffrey Ballet School, before joining the Eliot Feld Ballet as a principal dancer. His first professional job was as a dancer for Disney on Parade! This past May, the President and CEO of Rolex Watch USA announced that Patrick Swayze would be the recipient of the 2009 Rolex Dance Award. Swayze will be honored posthumously with the award on November 2 Career Transition For Dancers 24th Anniversary Jubilee Gala in New York City. Career Transition For Dancers is an organization that has helped over 4,100 professional dancers establish new careers when dancing is no longer an option. It is known that Swayze was passionate about horses and nature conservation. We can only guess that a gentleman of his stature would have also worn a Rolex watch, something classic that did not draw too much attention, but that would make a good match with all the roles, both onscreen and off screen, that Swayze played during his lifetime.